In this work, the electrochemical behaviour of hemoglobin (Hb) immobilized on self-assembled monolayer/polyaniline (SAM/PANI) coated gold electrode was carried out and the application of the modified electrode was performed for hydrogen peroxide (H2O2) sensing. Two different SAMs with different alkyl chain lengths were used (11-mercaptoundecanoic acid, MUA and 3-mercaptopropanoic acid, MPA) to form self-assembled monolayers on the gold substrate. After choosing the appropriate alkanethiol and coating the gold electrode with SAM, anilin was electropolymerized and Hb was deposited on this surface forming a new surface denoted as Au/SAM/PANI/Hb electrode. A couple of redox peaks of Hb were observed on this electrode at +0.15 V and -0.20 V in PBS. Optimum working conditions such as; the polymerization method (cyclic voltammetry, CV or constant potential electrolysis), polymeric film thickness of PANI, self-assembling time of thiol molecules, concentration of Hb, immobilization time of Hb, the effect of pH and the effect of scan rate were investigated. 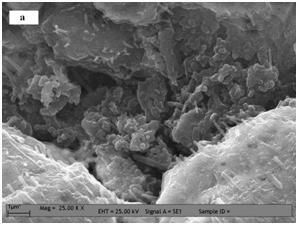 Electrochemical impedance spectroscopy (EIS), scanning electron microscopy (SEM) were used to characterize the modified electrodes and results demonstrate that Hb immobilization in SAM/PANI film was achieved. The electrode responded H2O2 linearly in the range of 7.40 x 10-6 mol L-1 to 1.27 x 10-4 mol L-1 with detection limit of 4.60 x 10-6 mol L-1.